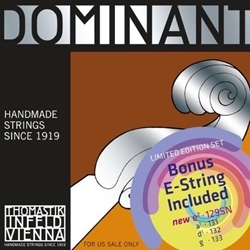 Dominant 135SNP Bonus Pack 4/4 Medium Violin Strings Dominant Synthetic Core 4/4 Violin Strings 135 - Aluminum Wound Ball End with Bonus Tin E String!!! 135B - Chrome Steel Wound Ball End These strings have a highly flexible nylon core with many threads and they are manufactured for artists who do not like steel strings. The general popularity of the Dominant string is their similarity and relationship with the gut string, without the gut string disadvantages. The sound of the Dominant string is round, soft, clear and rich in overtones, live, full and brilliant, not metallic, and has also the same good tone in bowing and Pizzicato, and also an excellent stability of tuning, under extreme climatic conditions. The beauty of the sound is not unlimited but if the musician changes the strings in time, he has the guarantee of always playing consistently good tone.